Away from the usual tourist routes! 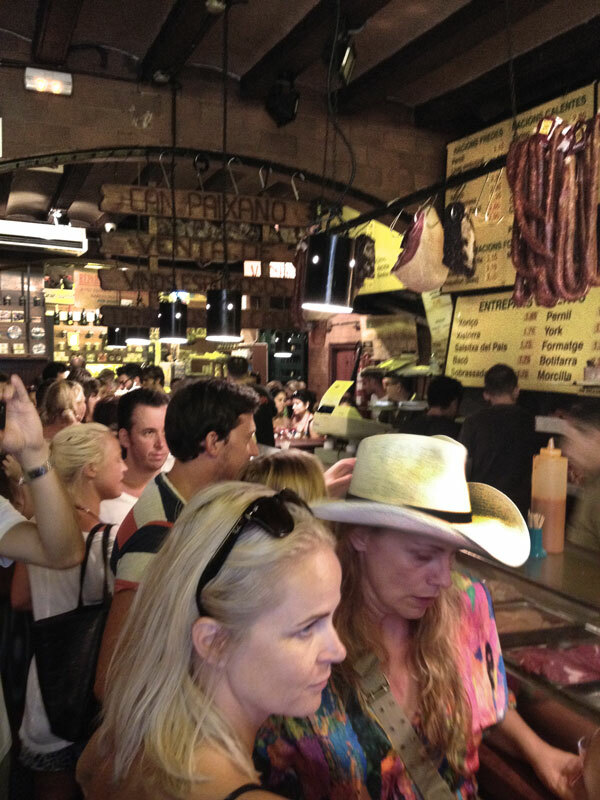 You will happen to feel real spanish flair visiting bars and deli shops exclusevly known by local people. Our tours start daily,even with bad weather-which rarely happens. The groups are of a maximum of 12 persons with a german and/or english guide,but we are pleased to organise tours with bigger groups. I’m an art historian, who loves the mediterranean cuisine. On our exclusive tour, you’ll discover carefully selected bars, deli ­shops, and a pâtisserie, all chosen for their first-class products. Perfect for all visitors, whether in Barcelona for business or pleasure. Our tour focuses on the charming and historic El Borne and Gotico neighbourhoods. Your guide will help you choose the best food for your personal tastes. Finish the tour with a visit to the best pastry shop in Barcelona. Tapas Tour Gourmet is a tapas and wine tasting tour designed for “Foodies” and for those with an interest in local wines and culture from Barcelona, Catalonia and Spain. It’s an all-inclusive tour like no other where you are going to love eating delicious tapas and really appreciate drinking fine wines! 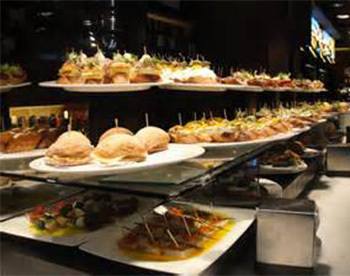 On our Tapas­Tour Gourmet you will visit some of the best tapas restaurants (one star Michelin), deli­shops, markets and a pâtisserie to have a typical tapas experience with cakes. 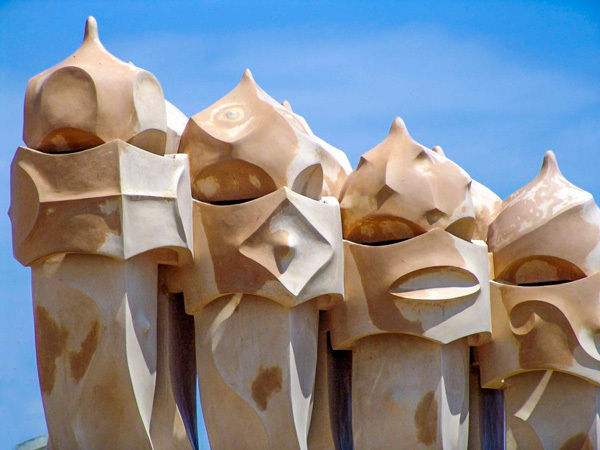 It is suitable for all visitors coming to Barcelona either on holidays or for business reasons. Our tour focuses on the charming and historic El Borne and Gotico neighbourhoods. 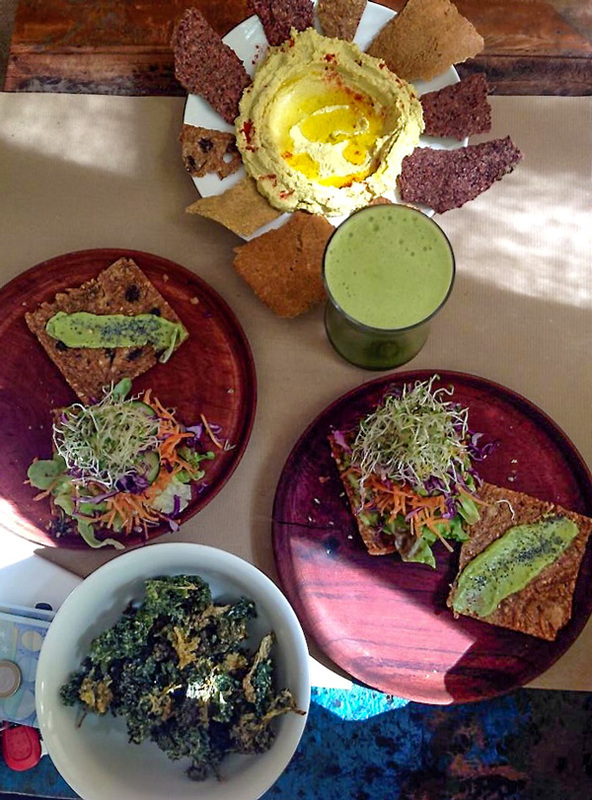 Your guide will help you choose the best food for your personal tastes. We will end our tour at one of the best patisseries of Barcelona. 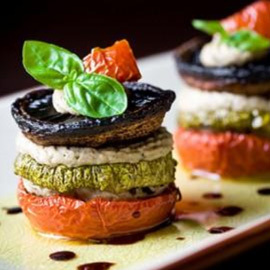 On the vegetarian – vegan Tapas Tour in Barcelona you will enjoy a tour of the cities History and Culture with culinary delights. Within the Born neighbourhood we will visit Cafes & Restaurants, and places that stand for a sustainable and healthy lifestyle, such as an urban garden project. You will get to know various social and artistic projects that are community driven. Tapa means lid in Spanish and is also the name given to a small appetizer, which is served to wine or beer, nowadays the offer ranges from a simple nibble to nouvelle cuisine. 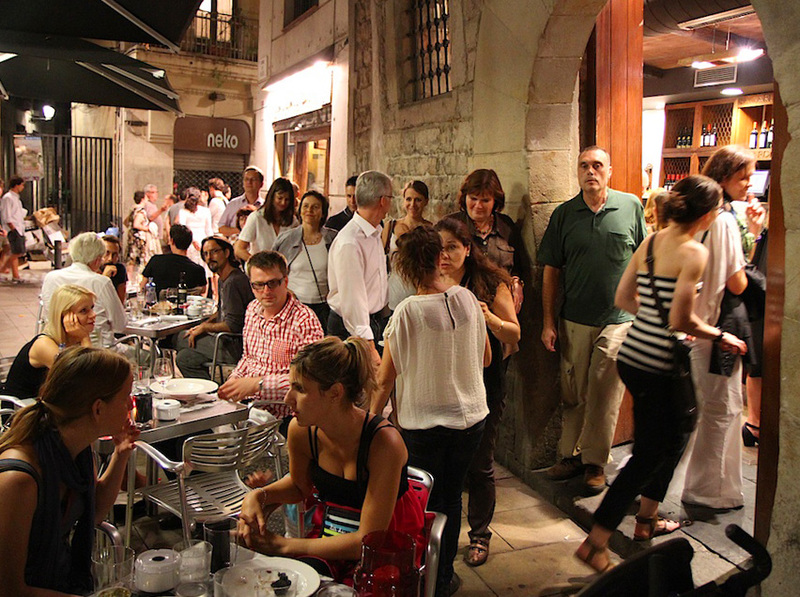 Tapas are a tradition and an intrinsic part of conviviality in Spain. Back in the day, typically in bars and bodegas the glass would be covered with a slice of bread, to save the drink from flies. In time, some barowners topped the bread with some olives or anchovies and gradually the small bites became evermore creative, today Tapas are an essential part of any social gathering. . In our Tapas Cooking Course we will learn to make tasty traditional Tapas Receipes and offer suggestions for your own Tapas Party. Discover the aromas of spanish cooking while learning from a local how to prepare traditional spanish receipes. 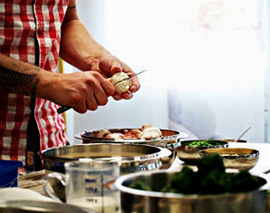 Entusiastic amateur or newcomer to the kitchen, all will enjoy the practical experience during this cooking course which is offered in small groups in Barcelona. At the end you will savour the dishes which you yourself have prepared, accompanied with some local wines. Brimming with Old World charm, the Barri Gòtic of Barcelona captures the ambience of centuries ago. This medieval quarter is a quaint, traffic-free world where almost every architectural detail seems frozen in the Middle Ages. Imposing Gothic buildings with magnificent facades have stood the test of time, and amazingly narrow pedestrian streets show the wear on their smoothed-down cobblestones. Unlike other cities in the world Barcelona is not known by an specific building but instead it’s an urban grid filled with sensuous buildings where architects such as Antoni Gaudí, Josep Puig I Cadafalch or Luís Domènech I Montaner have imprinted their creativity and created and given birth to a school which has made Barcelona learned to love architecture. 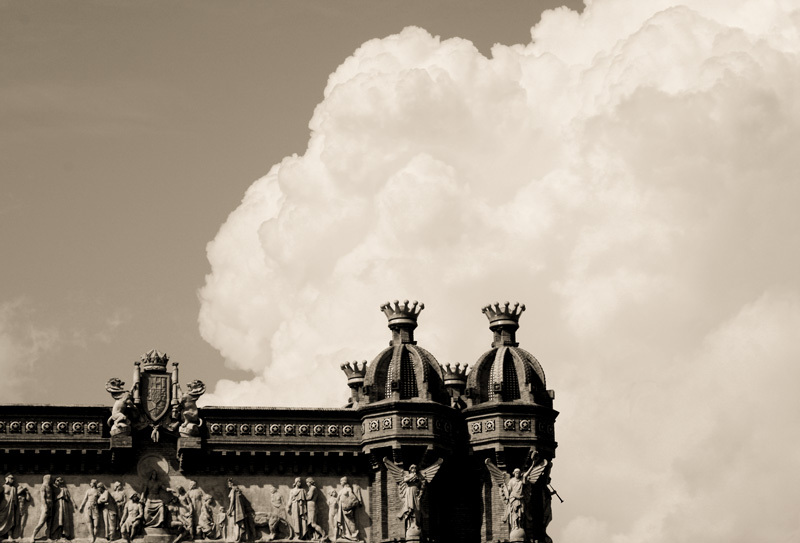 Through our tour we invite you to see how Barcelona has preserved this legacy and has made it part of the opened-minded and innovative character of our city.